Season’s almost over, who’d’ve thought it’d go by so fast? Thanks for the release, nerds! – http://i.imgur.com/bUYDBJ7.png – This line should be italic like the two before it. everything has been in QC for several days now, having problems with translations/technical issues? or just IRL stuff-to-do? GJM, DDY, FFF and more all appear to be struggling to release anything. Never before have I felt that the end of fan-subbing is upon us. Really hope this is just a temporary blip. Hi, what’s your current status on donations and flattr account? Was wondering if you need help to end the Tanaka-kun BDs. Herkz did state commie will be doing something next season, though it hasn’t been announced what yet. Probably some garbage. And first episode only. That’s their policy lately. The death of fansubs is here, literally no groups have announced to be subbing anything from summer 2017? Other than UTW, rising like a phoenix from the ashes. I was really confused when my RSS and email had a post from them. Not that I’m disappointed! Any status update? It’s been quite some time since the last release. Hope this doesn’t turn out like FFFansubs where nothing gets finished and you get berated for expecting that. With Fyurie gone I guess that’s pretty much it for what was one of (if not the) best fansubbing groups out there. If everyone can keep it going, great! But there’s certainly no sign of that. Am I the only one seeing Sagrada moving from QC to some new unknown Release status. A comment from any of the staff would be greatly appreciated re: all GJM projects, so many (blu ray in particular) are partially done. Fyurie quitting fansubbing made us all lose motivation, since things are stuck at QC. Period finished QCing ep 10 of Sagrada, and now we’re waiting for Fyurie to release it, since no one else can do that. When it’s released, I’ll finish translating the next ep, and if we manage to release it faster than this one, I’ll probably try to catch up with translating Sagrada. Alice seems dead for now, since Fyurie was editing it. Unfortunately, Fyurie is also the only one doing BDs, so all BDs are stalled right now until he feels like working on them. As for movies, I technically am planning to translate (or TLC) both HoneyWorks movie and Planetarian movie, but Fyurie was supposed to edit them, so I’m not sure what will happen now. We’re all kind of tired of fansubbing, it’s pretty pointless to put so much effort into it when we’re doing it only for a few people, because everyone watches simulcasts, and most of them don’t even care about translation accuracy. Fansubbing was pretty dead from the start, and nyaa dying and Fyurie retiring were probably the final nails to its coffin. We just don’t have enough strength and motivation to continue struggling to keep fansubbing alive. You should put a sticky post on the front page to inform everyone about this or they’ll keep asking in the comments section. Just feel sad that at least GJM could have at least finished this season first before quitting. 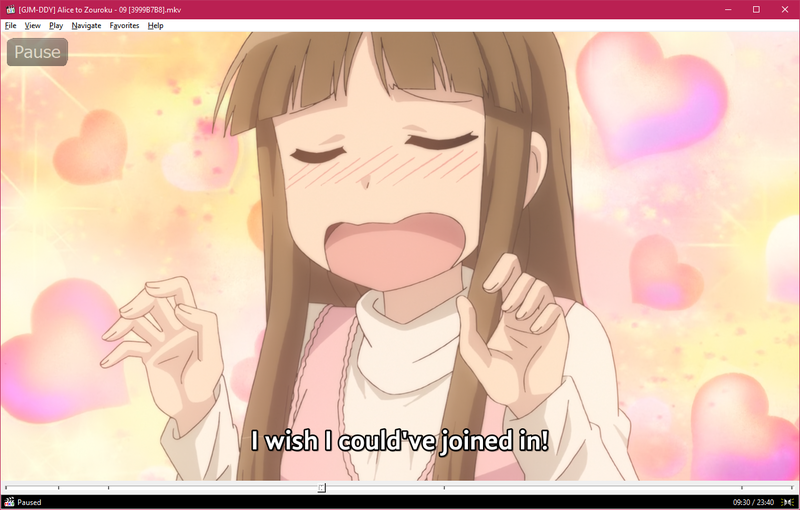 I’m sure I’m not alone when I say that I have never watched a simulcast, and have no intention of doing so. I have always been prepared to wait for a quality release, and if it is only appreciated by the few then so be it. Above all, it should be for the fansubbers own pride and personal satisfaction… you owe us nothing. I know it may not seem like it, but many of us appreciate the effort that is put into sprucing up these series. I prefer to see beautiful typecasting than the ones seen in simulcasts. I prefer to read accurate translations than ones that are not. Personally, I don’t mind waiting for your releases. Yes, I may watch the simulcast, but I prefer to save your version over theirs. In the end, you’re doing this for free (I presume) so I can’t beg you all to stay and finish. Whatever you all choose to do I will respect. Welp, there goes another decent group. Thanks for your efforts and good luck in whatever you pursue next. I guess it won’t take long now until we’re all better off learning Japanese and watching raws instead of the other alternatives. I’ve been watching fansubs for many years now, and I want you to know that I appreciate all that you and other subbers have done over the years. Even now, it just blows me away that people doing this in their spare time can produce such a vastly superior product to the people that are actually getting paid to do it and have access to the source material. Lately, I have been forced to watch more and more “official” releases, but I only do it grudgingly, when it’s clear that no one is going to pick it up. It’s not much, but I hope this lifts your spirits a little. There are still lots of people that appreciate the work you do. Except that those simulacast pretty much only cater for American and Canadian audiences; hence region-blocked for everyone out of it. As someone from outside those regions, people like you guys are a lifesaver when it comes to fansubs. And I really appreciate it. Fansubbing will only die when there is no one left who wants to do it. I for one am only interested in BD releases and so direct my efforts there. I can’t watch “””professional””” releases anymore because of the ugly font, bad/non-existent TS, and godawful editing, so I’ll always be around for making good BD releases. I’ve also been learning to TS recently because there are so few good TSers nowadays, although progress is, uh, slow for the more advanced stuff. I was the TLC and editor for Sallysubs’ release of the first HoneyWorks movie and I really want to do the second one. Depending on how you, Fyurie and the rest of the group feel about it, maybe we could work something out together? Thanks for your post though unfortunately, it makes pretty depressing reading. I’ve really enjoyed this groups releases in the fairly brief period you’ve been around, interesting choices and always good quality, it’ll be a shame if it ends like this but it’s also understandable. I’d like to write so much more in appreciation of all your efforts but I’ll keep it short and just say thank you to everyone associated with GJM. I’m sure there are many out there who want you to continue including myself, but that’s entirely up to you guys. > it’s pretty pointless to put so much effort into it when we’re doing it only for a few people, because everyone watches simulcasts, and most of them don’t even care about translation accuracy. I suppose I should be vocal that to me, there are plenty of aspects of anime subbing I consider important that simulcasts do not currently, and probably won’t for the foreseeable future provide. Accurate translations is the one aspect focused on here that I waver on, in that I only specifically go looking for those if it is a talk-heavy show, or a mystery or something where misunderstandings are catastrophic. But all the fun things, all the bells and whistles that come from signs, karaoke, font art, these are personal touches that simulcasts don’t have the soul to offer, and as long as there are slowsubs available for shows I’ll wait the extra half a week (when everything is running smoothly, admittedly) to watch them for that reason. Since it’s a joint effort with DDY and they’re inactive, do you guys know what’s happening with them?